When Claire met the Vipond family. Amy and Lee got in touch to arrange a photoshoot in May. They had been gifted some photoshoot vouchers by family when H was born and had decided to put them to good use the day before her 1st birthday party. When I arrived at their home on the edge of Blithfield Reservoir I was blown away by the fabulous scenery surrounding them on all sides and then when Amy said "well we've got some bluebells in the wood if you want to photograph there?" ...... you can imagine I was skipping away in that direction. This session is what I would call a sitter session and it was a real wake up call for me regarding the path I want to take. Cake smashes although lots of fun have always felt a little bit wasteful and I can't shake off those pearls of wisdom from my parents regarding wasting food. Thanks Mum and Dad! A sitter session captures that special time in your little ones life where they have proudly mastered sitting up unaided. They can be dressed in pretty/smart clothes & of course I take pictures of those pudgy little hands. <3 Love, love, love!! So, announcement time ..... I am going with my gut and not photographing cake smashes anymore. 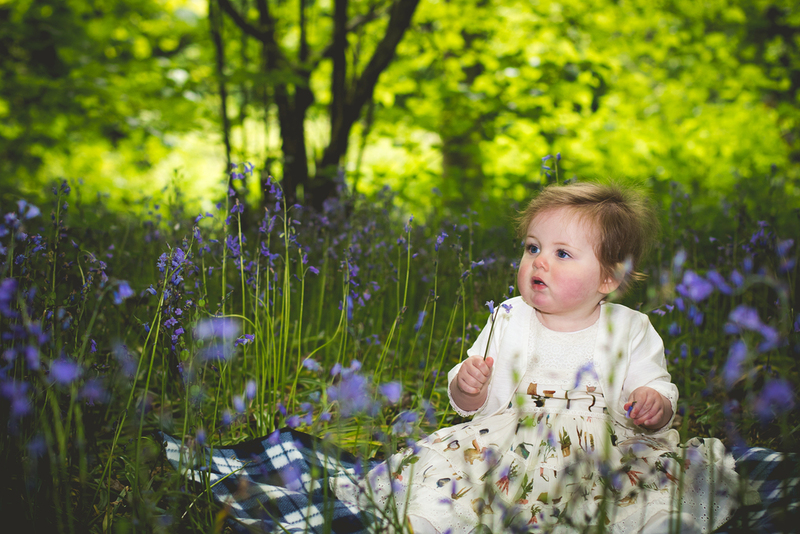 Ladies and gentlemen, here we have the only photoshoot I have done in, near or around bluebells EVER and my first sitter session. If you would like to book a sitter session for your little one please get in touch using the form below. It's never too soon to book. P.S. Don't listen to that old saying about never working with children and animals.